The latest version of De Bellis Antiquitatis, or DBA for short, is version 3.0 and is available in a 144 page hardback. What is this latest version about and what will it deliver? This short description will, I hope, explain a few aspects of the rule book and be useful for those that are new to DBA or those familiar with earlier versions. Back in 1990, when first released, DBA took the wargaming community by storm. Armies were affordable and games would typically last around an hour due to the simple mechanics. Ancient wargaming was revolutionised. Of particular interest to me was the ability to refight Ancient battles. Soon armies in my then local gaming group were being formed to refight the battles of Alexander the Great or those of the Wars of the Roses and the Norman Conquest all of which seemed unachievable before DBA as hundreds of figures needed to be collected and painted. The latest version provides all that and more. 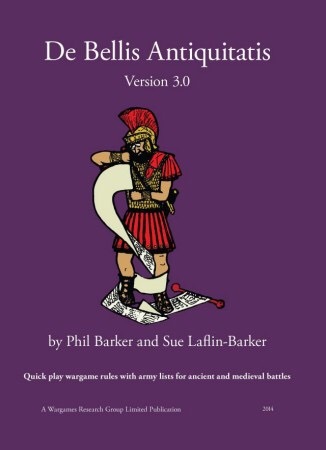 “Our original intent was to provide the simplest possible set of wargames rules that retain the feel and generalship requirements of ancient or medieval battle. The rule mechanisms were [in 1990] then entirely new. They started from the assumptions that the results of command decisions could be shown rather than the minutia of how orders were communicated and interpreted, that the proportions of different troops fielded were decided by availability within their culture and not cost-effectiveness against the current opponent, that differences between troops of the same class and era were relatively unimportant, and that most shooting regardless of theoretical weapon range was at very short distances. The resulting system is more subtle than may be immediately apparent, and is the fruit of much detailed development work. The rules themselves include many enhancements designed to streamline play, reduce gamesmanship and to ensure DBA both produces a realistic simulation of Ancient and Medieval warfare but also an enhanced the game. Complete with clearer diagrams DBA 3.0 is a far superior rule set than previous versions. But DBA 3.0 doesn’t stop there. The entire army list section has been expanded and while retaining over 300 army lists additional sub-lists are included. The DBA gaming table is a flat surface which for 15mm scale figures is typically 600mm by 600mm and you will see this sized table, along with my 15mm troops, featured on this site. DBA 3.0 also supports a slightly larger playing area for those that prefer this option. Below, two armies Greek armies deployed on the table during a refight of the battle of 2nd Mantinea, fought in 362BC. As with earlier versions the surface of the game board is by default clear and open terrain. To this you add terrain pieces. In DBA 3.0 terrain pieces include areas of fields, with or without crops, woods, towns or cities, hills, gullies, areas of marsh as well as water courses such as rivers and waterways. The much-discussed “built up area” has been expanded to cover cities, towns, forts and edifices each adding their own specific attributes to the game. The visual aspects of the game can be greatly enhanced by well constructed terrain pieces. At the same time this terrain can be simple and inexpensive to build. Below, steep hills and woods can be seen on the table all of which is home made. DBA 3.0 provides plenty of opportunity for players to add to the visual aspects of their games yet retain transportable terrain. Each army consists of twelve troop elements. These elements are the basic building block of your army. They represents a group of soldiers that move and fight as a single unit. Physically, an element consists of a rectangular base with one or more figures or models attached. In the basic game the 12 elements represent the major combat groupings of an army. Depending on the army and period the actual number of figures is variable. DBA is about fighting battles, not skirmishes; it just uses fewer miniatures to achieve this. In addition to these 12 elements a camp is required. A camp provides an interesting modelling project and often comprise tents, carts or animals as well as a small number of figures called camp followers, to garrison it. In DBA 3.0 it is possible for these camp followers to leave the camp in the capacity of a decoy or false reinforcement. However, this has its risks and increases the ability of the enemy to capture your camp. Larger games involving more miniatures are also possible. The rules provide details on how to combine three standard armies for “Big Battle DBA” and also how to use the rules for playing even larger games. When playing larger games, or historical refights, an element of foot generally represents between 500-600 foot other than horde, 1,000+ horde, or 250-300 horse or camel riders. Other elements represent up to 25 elephants or 50 chariots, war wagons or catapults and early cannon. That said, these ratios are often changed depending on the size of battle being modelled. Additional terrain types such as gullies, rough going and a range of built up areas to provide more variety. A revised terrain placement system producing a less player customised battlefield which enhances the game. Deployment changes to encourage historical troop deployment. Larger moves to encourage more dynamic play. Changes in rear rank support to provide greater consistency with historical depths. An introduction of solid and fast ratings to better model the differences between some troops. Rules to remove geometrical ploys. Revised threat zones to requiring greater consideration of reserves. There are of course several other changes, too many to describe here. Despite the changes, and several additions or clarifications, DBA 3.0 remains a very enjoyable and far from complex game system. A major change to DBA 3.0 is the large expansion of the army lists section. Each of the 300+ army lists now has a background section including suggested additional reading. This provides interesting reading to both new and veteran gamers. Many lists are further divided into sub lists with all having a brief, but clear, description of the troops forming the army. This useful feature will greatly assist players looking to build armies. Hopefully this short primer on DBA 3.0 explains a few of the DBA basics for those new to Ancients, as well as the changes from earlier versions for those DBA veterans. Other articles on this site will expand on this short introduction.